Want to learn more about Adobe? No reuse of content and properties without custom implementation. It is an all or nothing deal: A Reference is an exact copy of the referenced component, i.e., you cannot share a title or background image via the Reference component if you want the body copy to differ. Authors must track down the single “real” version of a component to make changes. If not used carefully, Reference components can create a nasty spider web of content references across a site. AEM 6.2 introduces Content Fragments, which can also aid in reuse of content in certain situations, but it, too, is not a complete solution. When our team first encountered this limitation in AEM, frankly we chalked it up to our lack of in-depth knowledge about this topic. Surely AEM had a standard solution for shared content and shared component properties, right? Unable to find this “holy grail” in the jungle of AEM documentation, however, we developed a custom solution for what we termed “global properties” on our sites. Having a workable solution in our pocket, though, we still kept an eye out for the “correct” solution. But as we chatted with other leading engineers in the AEM space at conferences such as Adobe Summit, seeking “the AEM way,” it became apparent to us that there was none for shared content and properties. Ensures consistency of a component's content across an entire site without copy and paste. Allows shared content and properties to be overridden at the individual component instance level when desired. Provides an intuitive, integrated authoring experience with no paradigm shift from OOTB AEM authoring (seamless implementation). Applies universally to all components that define a “shared” properties dialog, with no specialized implementation required by developers. Can be submitted to ACS AEM Commons for use by the AEM community. As the dust settled and the clamor of the hackathon died down, our development team was able to put a checkmark in the box for all of the above goals, including an “alpha” level pull request to ACS AEM Commons. Our feature received immediate positive feedback from the maintainers of the repo, further motivating us to polish up the implementation from its 1½ day hackathon birth to “just make it work” into a feature ready for primetime. 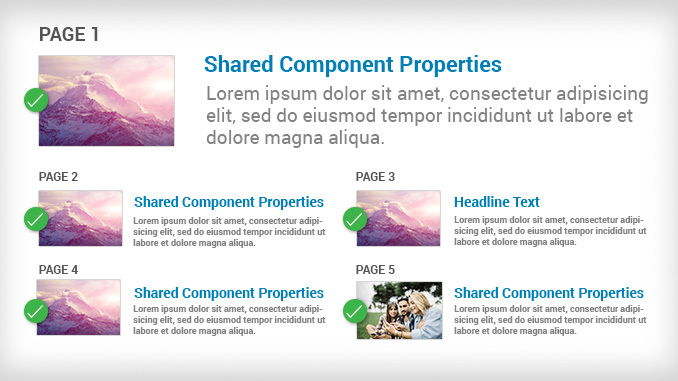 Shared Component Properties is now officially available as part of the ACS AEM Commons library. Component-specific “shared” properties can be configured for any component by adding a new “shared properties” dialog. Component-agnostic “global” properties can be configured for any component by adding a new “global properties” dialog. Authors can be allowed to override “global” and/or “shared” property values with “local” values, e.g., a component can share content for 10 instances on a site, but still allow an 11th instance to have unique content. No new learning required for implementation. No alteration of existing functionality; instance-level component properties and dialogs are unaffected. Supports both Touch UI and Classic UI. Let’s put this into practice for a company that runs a monthly promotion on their website. The company wishes to display the promotion on all pages of the site that use template X or template Y, totaling 50+ unique pages. To reduce the workload and chance of error while executing monthly updates, authors would like to change the promotion on just one page and have all other pages reflect the updates automatically. Lastly, the marketing group threw a wrench into things (as can be expected) by asking for the ability to tweak the promotion headline on its seasonal “summer” and “winter” pages. To solve this scenario, let’s start with the Background Image, Headline Text, and Main Promotion Copy. These three properties would all be implemented in the “shared” properties dialog for the Promotion. This allows an author to specify those values on any one page of the site, all other pages automatically reflecting those values. This simple change of specifying properties as part of the “shared” properties dialog instead of the standard properties dialog puts us 90% of the way to our goal! Next is the Brand Logo. The Brand Logo could be implemented in the “shared” properties dialog as well, but a brand logo is something that is quite likely universal to multiple components on the site. For that reason, it would be smart to specify the Brand Logo on a “global” properties dialog for the Promotion component. Other components that need a brand logo, such as a Page Footer, can then specify the same Brand Logo “global” property. In that way, the Brand Logo needs to be set only once for all components on the entire site: 95% complete! Last is that seemingly tricky requirement from marketing: The ability to change the promotion headline on its two seasonal pages while still allowing all 48+ other pages on the site to use the shared headline. To enable this, the component simply needs to specify the same Headline Text property as declared on the “shared” properties dialog on the standard properties dialog as well. Witty marketing authors can then go to the component on the “summer” and “winter” pages and use the standard dialog to set the headline to “Hurry while this deal is HOT!” and “Get in on this cool deal!” respectively. Leaving the standard dialog value empty on the remainder the site means the rest of the pages continue to use the Headline Text from the “shared” properties dialog. You’re done! Marketing is happy. Authors are happy. You’re happy. For more on this topic, check out Brett's Shared Component Properties podcast. Magento 1 end of life is happening in June 2020. Read more on how this will impact you and how you should proceed as a Magento user. Following last year’s win as Adobe Emerging Partner of the Year, Bounteous provides session leadership, drives product demos, and takes home back-to-back title of AEM Rock Star.